Mace Training in Austin…and no, not that kind of mace. This morning I’m flying to Austin to attend a Mace Training Certification this weekend. I’m really excited to go to the ONNIT Training Academy to learn more about how to use this old school training tool, which is something I think is going to be big part of the future of mountain bike training. However, not a lot of people know about the Mace and how it is one of the oldest training tools we have access to. In fact, every time I tell someone that I’m attending a “Mace Seminar” I have to quickly explain that I’m talking about a Steel Mace for strength training and not the kind of mace you spray in people’s faces. I’ve actually gotten some pretty strange looks from people until I explain that little point. All of that is fine with me, though. Just like kettlebells were when I first started bringing my own to the gym back in 2004, the Mace is an underground training tool that few know about and even fewer know how to use properly. 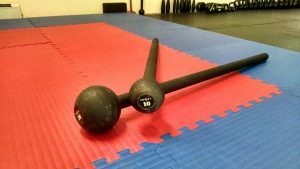 The thing I like the most about the Mace – and its cousin the Indian Club and distant cousin the Kettlebell – is that it lets you work on what I call your Upper Body Cardio. Upper Body Cardio is something that few riders think about training but it is really the weak link for most of us. While we feel our legs giving out, our upper body strength endurance plays a huge role on the trail. One study actually found that Grip Strength Endurance (which is a big part of your overall Upper Body Endurance) played a direct role in how fast you could ride your bike downhill. And since most trails have downhills that means you need to focus on your Upper Body Endurance as well as your legs. This means that having ways to train this area of the body is extremely important. To help you get some ideas on how to do this I am going to post a replay on Monday of the webinar I did a few weeks ago on Upper Body Cardio Training. In it I’ll show you can use old school tools like the Mace, Kettlebell and Indian Clubs to help you improve your Grip Strength and Upper Body Endurance. I also plan on creating some programs that use the Mace, both by itself and with other tools like the kettlebell. 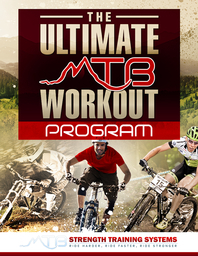 Keeping you on the cutting edge of mountain bike training is my goal and I think that you’ll really like how these tools add variety, fun and new challenge to your workouts. I’ll do my best to stay out of trouble in Austin this weekend – which isn’t always as easy as it sounds – and I’ll be in touch Monday with the link to the replay of the Upper Body Cardio Training webinar. I recommend starting with a 10 lb. Mace. You’ll want to get a 15 lb. Mace after you get stronger but I find the 10 lb. one is good to learn with and you can still make it feel really heavy with the leverage you can get from the long handle. I recommend the ONNIT brand maces, they are well made and very reasonably priced.